The advent of the easily programmable and efficient CRISPR/Cas9 nuclease system has revolutionized genetic engineering. 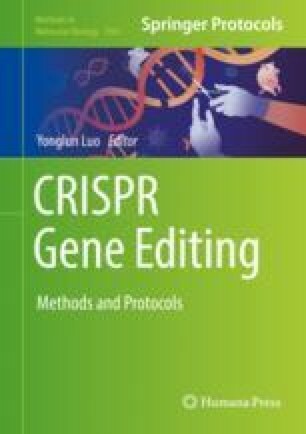 While conventional gene knockout experiments using CRISPR/Cas9 are very valuable, these are not well suited to study stage-specific gene function in dynamic situations such as development or disease. Here we describe a CRISPR/Cas9-based OPTimized inducible gene KnockOut method (OPTiKO) for conditional loss-of-function studies in human cells. This approach relies on an improved tetracycline-inducible system for conditional expression of single guide RNAs (sgRNAs) that drive Cas9 activity. In order to ensure homogeneous and stable expression, the necessary transgenes are expressed following rapid and efficient single-step genetic engineering of the AAVS1 genomic safe harbor. When implemented in human pluripotent stem cells (hPSCs), the approach can be then efficiently applied to virtually any hPSC-derived human cell type at various stages of development or disease. The authors would like to thank Dr. Mark Kotter, Dr. Sanjay Sinha, and the members of the Vallier, Kotter, and Sinha laboratories for their help with the validation of this methodology. We would also like to thank Dr. Kosuke Yusa for providing the AAVS1 ZFN plasmids. This work was supported by a British Heart Foundation PhD Studentship (FS/11/77/39327; A.B. ); a European Research Council starting grant Relieve IMDs (281335; L.V., A.B. ); the Cambridge University Hospitals National Institute for Health Research Biomedical Research Centre (L.V., K.E.S. ); the British Heart Foundation Oxbridge Centre of Regenerative Medicine (J.D.C. ), and a core support grant from the Wellcome Trust and Medical Research Council to the Wellcome Trust—Medical Research Council Cambridge Stem Cell Institute (PSAG028; L.V. ).